Adding memory to your Nook is fairly easy, and requires no tools. A lot of people have been coming to WritAnon, trying to find instructions on how to add memory to Barnes & Noble’s Nook. 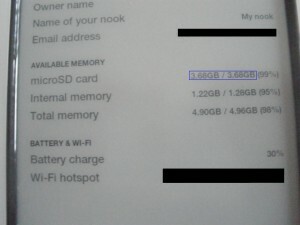 This is mostly because I said adding memory was simple in one of my previous reviews of the Nook. While the blog at WritAnon isn’t generally a technical blog, adding memory to a Nook is fairly easy, and it makes sense that writers would need to upgrade their Nooks. The hardest part with upgrading your Nook’s memory is just getting started. The whole procedure should only take a few minutes. If you haven’t already done step 2, you’ll likely need to bookmark this page so you can come back to it. If you have, you may still find a reason to come back, or send the instructions to a friend at a later time. While you’re at it, consider subscribing to our RSS feed to find out more about writing for a living and pleasure. There is at least one post every week. 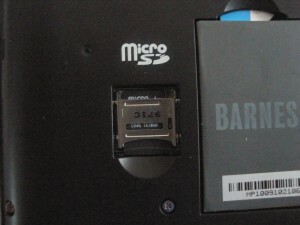 In order to do this upgrade, you’ll need a MicroSD card. I used a 4GB card made by PNY, but I’m fairly certain that virtually all of them are the same, just with a different name stamped on the cover. 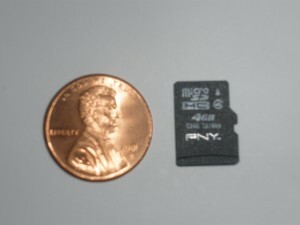 MicroSD cards are very small…they can fit entirely on the surface of a penny. 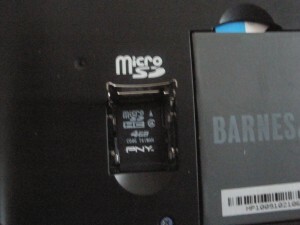 If you don’t have a MicroSD card, you may want to purchase one. I’ve linked to a few different types below. Disclaimer: I get a few cents for each card purchased through these links, so this is a good way to thank me for the information included in this entry. You’ll need to make sure your Nook is powered off all the way. You can do this by holding your power button (the silver button on the top of the Nook) for approximately 5 to 7 seconds. Taking the back off of your Nook takes a bit of work, but it comes apart without the need for any tools. If you look carefully at the side, you’ll notice a small thin gap, just large enough to put a fingernail in. If this is your first time opening up the back of your Nook, the safest bet is to place the Nook firmly against a soft surface as you pull the back cover off. This will take a fair amount of force, so be careful not to lift the Nook off of the surface. From here on out, the steps are actually pretty easy. Once the back cover is off, you’ll see two things: the battery (the larger rectangle with the screw holding it down) and the memory card expansion slot. You should lift the cover as shown below. 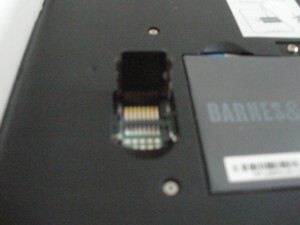 You’ll see the electronics underneath are exposed so you can insert your MicroSD card. This sounds like more work than it is. All you have to do is lay the card so that the gold contacts on the card match the gold contacts on the Nook. The card should lay flat and smooth, resting in the notches built into the card. Assuming that the card was laying flat, this should take very little effort. There will be a very slight snap when the cover is in place, but unless your hearing is excellent, you probably won’t hear it. Now the hard part is over, and you could test the new card now, if you wanted. However, since there’s a small chance you could bump the back cover and cause the memory card to fall out, you should proceed on to the next step. Make sure that you line up the cover correctly (the grooves for the power button are what I used), then snap the cover back on. When you enter the settings menu, you should see your new microSD card show up in the available memory. Now you’re ready to use your additional memory to store new pictures, songs, or, of course, more books. Did you find this article helpful? Please leave a comment expressing your thanks below! Over the past two weeks, I’ve had a pretty good opportunity to use the Nook, trying out various functions and the purchasing process. Where are the thousands of free books for the nook? To correct an earlier post, I was able to find the “thousands of free ebooks”. These free ebooks are made available through Google Books, and can be found by entering nothing into Barnes & Noble’s search tool, then sorting by price. The lowest price books will be the free ones. The free ebooks section only contains Barnes & Noble’s current “preferred” selection. This is a bit misleading, in my opinion, but once you understand this, you can quickly find many classic books, as well as various other topics. For example, I downloaded several books from the early 1900s about Atlantis–I was curious about what the thoughts from a hundred years ago were on the lost city. Is the nook an eReader for writers? Unfortunately, the Nook isn’t designed for use by writers. I’d hoped to be able to use the Nook to edit my own work. The highlighter takes a fair amount of time to use, and trying to type notes take too long to be useful. To be fair to the Nook, it was designed with readers in mind, not writers. It appears that tablet PCs are still the best available method for writers to take notes on their work. The nook has a good, hefty weight that makes it feel almost as solid as a real book. Turning pages and selecting books are intuitive. The color, multi-touch screen at the bottom of the Nook is impressive. It is easy to add books to your nook via Barnes & Noble or the USB interface. Adding memory to the nook is actually fairly simple. The battery life is reasonably long (several days). 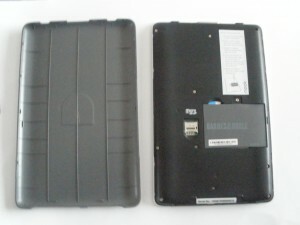 The thin casing for the nook makes it more likely to slip (though this is also an issue with the Kindle). There are no styluses available for the Nook, though this would make the interface much easier to use. There is no ability to browse the Internet (beyond the B&N store) or add your own custom RSS feeds. There is no .doc support. Overall, I’m still pleased with the Nook purchase, but there is a lot of room for improvement in the next generation. It’s certainly nice to carry just one Nook rather than the 4-5 books I typically bring on vacations. If you’ve found this review helpful or have further questions, please let us know in the comments below.